On Sept 30, the Bangkok bohemians will have our rhapsodical ecstasy. We've probably heard Bohemian Rhapsody 1,001 times, but for many it will be the first time we'll hear it live. 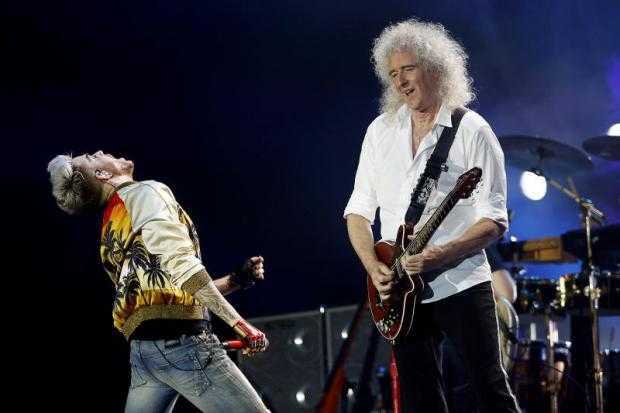 "Queen + Adam Lambert On Tour 2016" will make a stop at Impact Arena with legendary rockers -- Brian May on guitar and Roger Taylor on drums -- charging through its repertoire with the new flamboyant frontman. It was in 1991 that Freddie Mercury died from a complication caused by Aids, but it's undeniable that his voice -- his spirit maybe -- continues to be associated with Queen's hits, from "Bohemian Rhapsody" to "We Are The Champions" and "Love Of My Life", plus many, many more. Lambert, first a star of "American Idol", has toured with Queen since 2014, and it's not hard to tell why: the high-pitched voice, the campy confidence and stage panache breathes youthful life into the 45-year-old band. But here we have Brian May, the original co-founder and writer of many Queen hits. May, now 69 and who has a PhD in astrophysics, answers our questions on the continuing relevance of Queen, as well as how Lambert fits into the spirit and legend of the band. How has Queen changed, or hasn't, musically and spiritually after all these years? The big question. Well it's something that we think about a lot and I think for Roger [Taylor] and I when we lost Freddie we both felt that it was over. And maybe we overreacted but we were thinking, no never, we could never do this again. Organically some things happened and we met Paul Rogers and we made some music with him and then cutting a very long story short we met Adam Lambert and discovered that he had so many of these attributes that we needed to make Queen music as we did in the past. You still enjoy performing, it's obvious. I just look at the people and I see them happy and I see them enjoying the spirit and the ideas we've created and we're still developing. I feel that we're different but we're the same. We have the same ethos about us, we care about our music, we care about entertaining people and challenging people, and there is some indescribable thing that's happened in rock music which is inspiring in a way that nothing else can be, it gives people power. It gives people ownership of themselves and certainly when we play songs like "We Will Rock You" and "Bohemian Rhapsody", we're tapping into an energy, which is already in people because those songs have become woven into people's lives which is a great privilege. Some of Queen's iconic songs remain, yes, iconic after all these years. It's hard to explain I believe, but why do songs such as "Bohemian Rhapsody" and "We Will Rock You" still sound relevant to new generation audience? I think certain things are eternal [for humans]. Their hopes, their dreams, their disappointments, their sadness, their love, their successes, their joys -- these things are not tied into one particular time. Maybe we were lucky in the way that we wrote songs. But we wrote not from the point of view of ourselves, but we tried to connect with the feelings of everybody because we felt we were everybody. We were just people, we weren't writing as rock stars -- we were writing as people. So a song like "I Want To Break Free" encapsulates a lot of people's feelings about them wanting to become themselves and to break the chains that bind them. "We Will Rock You" has that thing -- it's the dream of thinking I can change the world and what happens to it. And "Bohemian Rhapsody" of course, is one of the world's greatest mysteries. Nobody really knows everything about that song, it's quite a complex thing but also it's about finding yourself, I would say. What's it like with Adam Lambert as vocalist? Well Adam, I hate to use normal phrases, but he ticks all the boxes, really. He has an extraordinary instrument. Even Freddie, if he listened to Adam he would go, "My God where did that voice come from?". Freddie had one of the world's most extraordinary voices but Adam has an instrument that you wouldn't find in a billion people, which is beautiful. Fortunately, Adam has the rest of the stuff that goes with it: he has dedication, he has talent, he has understanding, he has musical empathy and he also has an ability to entertain, very much like Freddie. He has a chemistry that comes from him, he works with an audience and has this camp quality which is also a lightness of being which is slightly self-mocking so he has great confidence, he has the ability to send himself up. I wrote "We Will Rock You", Freddie wrote "We Are The Champions" and the next time we went out we had these built-in opportunities for the audience to interact with us and both of those songs have something else written inside them, which is the feeling of unity, the feeling that we are all together and we have some kind of power. I don't think we realised it at the time. Now at a sports match you have the same feeling but they're in conflict with the other side so that feeling becomes, in some ways, because you're fighting an enemy, but of course it's a trade-off in our situation everybody's on the same side so you have a massive amount of energy at a Queen concert when people are singing "The Champions"!